Brush chicken with a mixture of Dijon mustard, lemon juice and olive oil for Lemon-Mustard Roasted Chicken. You're in for one easy, delicious entrée with Lemon-Mustard Roasted Chicken. Mix mustard, lemon juice and oil until blended. Place chicken on rack of broiler pan; brush with mustard mixture. Season with pepper. Bake 40 min. or until chicken is done (165°F). 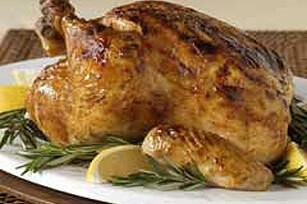 If you don't have a broiler pan, you can bake the chicken on a roasting rack placed in a shallow baking pan instead.